I would be very surprised if they found anything! I’ve checked the lidar data and did’nt see anything abnormal! Hat..The surveyors checked they Lidar for the Barratt site ands thats why they found the anomaly in the ground. I have the lidar and can see exactly where they found the items. Hence why they named it after the find! Can you see any anomalies...a few tiny pits here and there?? May be something may be nothing! They are digging shallow trenches running across the contour lines (and playing mud pies). 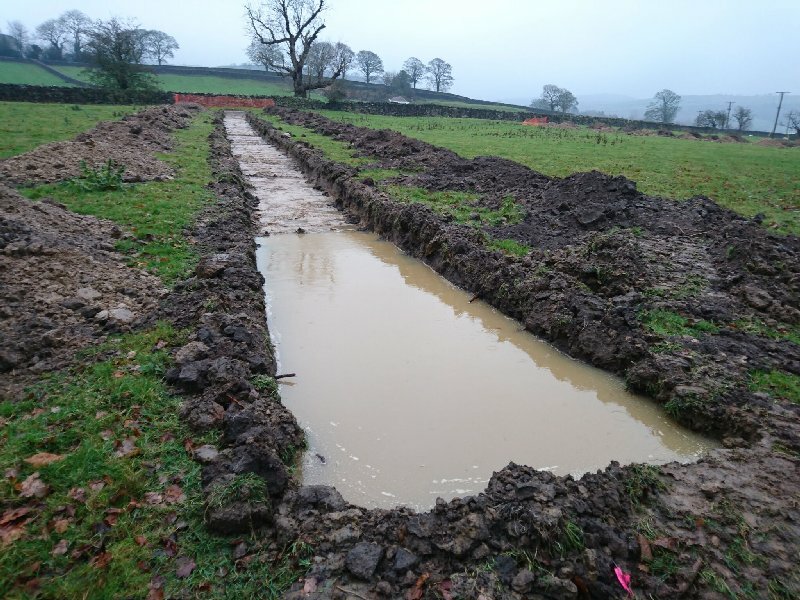 This shows how wet the ground is and how unsuitable this ground for a school, this ground and the surrounding fields are unsuitable for ANY building. From the size of the soil heaps, top soil on one side and underlying boulder clay on the other, you can see how shallow the top soil is over the boulder clay. The boulder clay is largely impervious to water hence every trench ends in a swimming pool. .... and this ground on the top surface is not even wet yet (in comparison to how wet it gets during the winter months, when the water oozes up around your boots as you walk). When this ground is concreted over, 50% of the school will be hard surfaced, all this water will have to go somewhere. Expect more flooding lower down! So rather than responding and allowing me to add an acknowledgment you reported my facebook post and had it removed? That’s a bit petty don’t you think? That was NOT me, I haven't looked at your post on Facebook again and I DON'T post on Facebook sites. While I'm writing here I will post my thoughts on the facebook posts without acknowledgement of source. This is not aimed at you Hat but Facebook users in general and anyone else that doesn't see a problem with reusing others media with asking or at least quoting their source. I take a lot of photographs of Silsden and share them on my websites. I have no problem with people using them as long as the source is acknowledged, they may be in the public domain but they still belong to me. You wouldn't copy a picture out of a book and put it on a website without providing a reference, why is it OK to pass a digital picture off as your own? Pictures on this forum are used to illustrate a point made by their author, if the picture is used on another website without the accompanying text and reference the picture may lose its meaning. The picture above was used as an illustration of the impermeability of boulder clay, but when it was shown on Facebook it became a story about flooding. What you should have done Hat is put a direct link to the article on this page you wanted to utilise on Facebook, rather than steal an image and rework a storyline to suit yourself and gain some kind of credit!! I hope you learn from this one! Oh and Congrats to whoever pulled Hat over!! Lets get back to the main article/issue now! It's a little harsh to single out a single Facebook user. My point was the problem is a general Facebook problem. Posts are routinely linked into Facebook sites from online news sites but there is usually a link back to the source site, inserted automatically. Unfortunately the same users think it's OK to use pictures from all websites without permission or acknowledgement. Can we get back on the subject please. It was by the barn at 10am this morning. It is still near the barn not in use. Dont you think they are rained off? Ground conditions are too wet for any progress. By the way Peter i didnt single the person out..they singled themselves out! Three days in mud all over Hawber cote lane. used for wheel cleaning whilst ever construction or delivery vehicles are leaving the site. safety and to accord with Policy TM19A of the Replacement Unitary Development Plan. PS There are quite a few other conditions in the document which builders love to ignore but should be held to account. Yes Peter they all do it, our favourite local builder parked on Banklands lane while they built there houses when planning conditions said loading and unloading only. They also worked on Saturday afternoons, against permission. If you don't believe me ask Skippy, I complained to him three or four times before they stopped. Because of the underlying boulder clay this land does NOT absorb water. This is the state of the ground two days after my last picture. It has not really rained since my last picture was taken, but there is a lot of water still in the trench. Expect floods on the lower ground when the school is built. 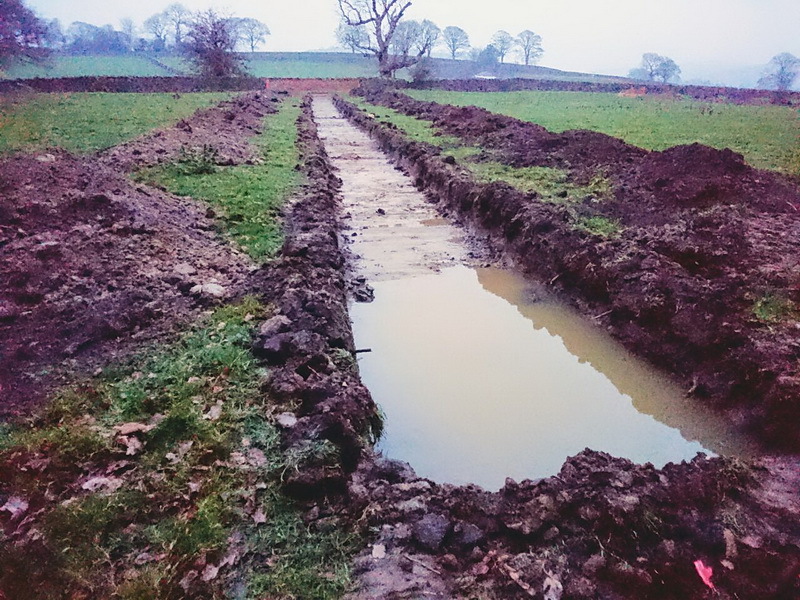 I looked at the trench this morning (before it was filled in) and the water was back up to the level of my first picture. It will be interesting when they start building, there will be lots of mud! 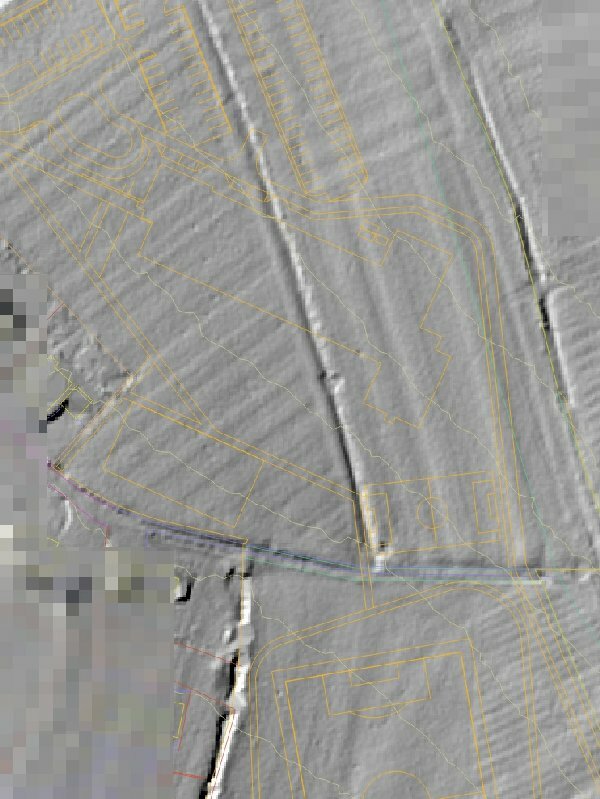 when I asked the man doing the survey if they had found anything he said that the trenches where dug at random because nothing had shown up on the geo survey. He also said that only 200 year old things had turned up, and were not of any importance. Like I said..i checked the Lidar and saw nothing abnormal!! 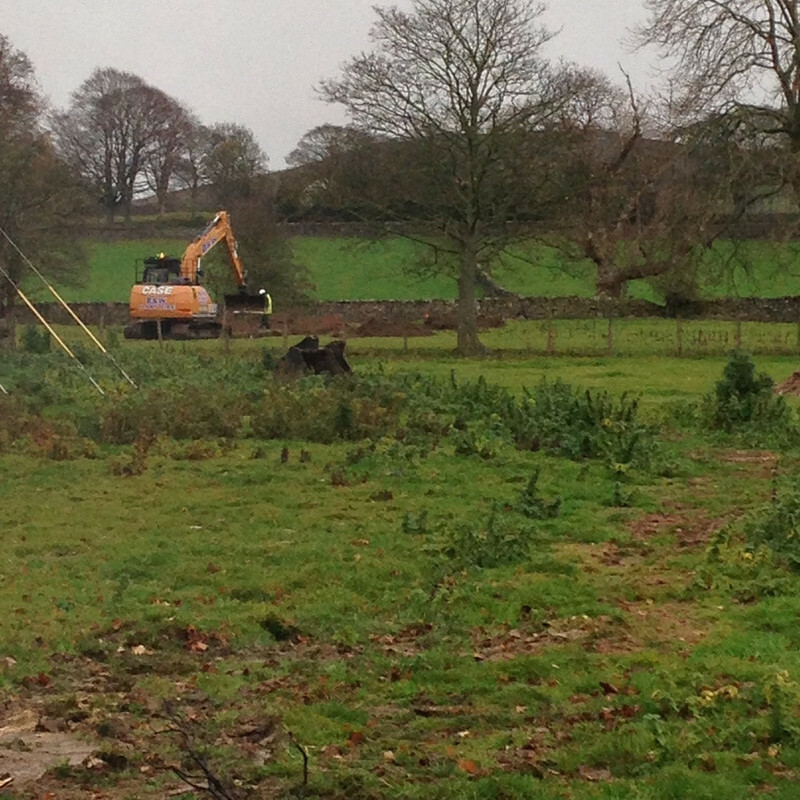 There are a few sites around Silsden which might reap some treasure though!! Anyone want to go 50/50?